Decreased Cleanliness and Sterility – After opening raw material packaging, a sample needs to be extracted or a sampling probe must be inserted into the material. This introduces the possibility of tainting the sample with chemical or biological contaminants. Also, if the same probe is used on multiple products it increases the risk of cross-contaminating the raw materials. Increased Spoilage – Some materials are vacuum packed or otherwise protected from humidity, oxygen, or ultraviolet light. Opening the packaging permits exposure to these elements that may reduce the shelf life, cause clumping or agglomeration, or degrade the material in a manner that makes downstream processes fail. Risks to Personnel Safety – Occasionally incoming materials may present a hazard to receiving or laboratory personnel who are tasked with opening the packages and performing the analysis. Often, gloves, respirators and other personal protection measures are required which increases the costs and risks associated with the activity. A few technologies exist today that allow sampling of raw materials through their packaging. For example, specialized Raman spectroscopy techniques can sometimes sample through semi-transparent packaging. However, Raman spectroscopy suffers from fluorescence interference, tends to have a small sampling area, can burn the sample or packaging, and is sometimes difficult to use as a quantitative technique, making it problematic for many applications. 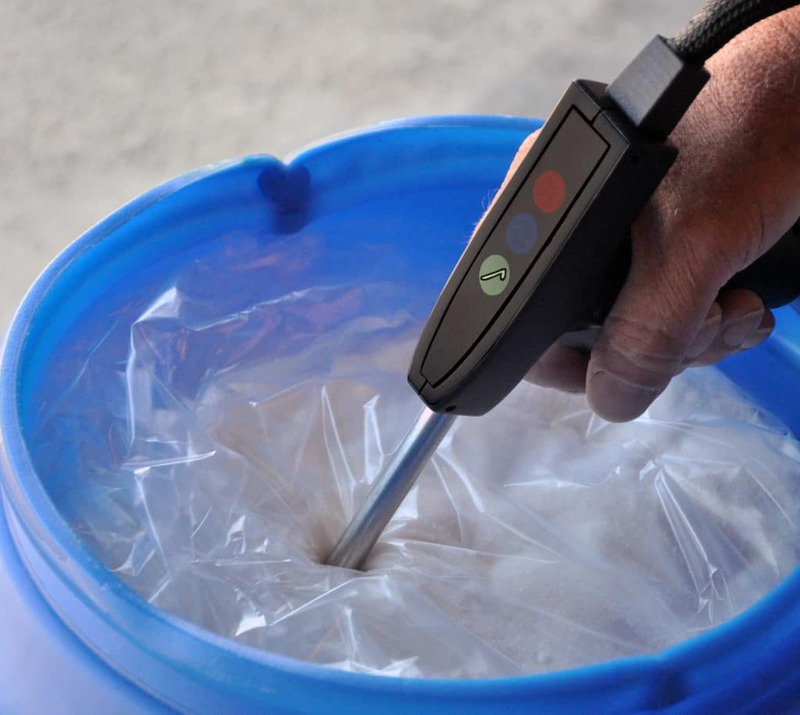 Raw material identification using FT-NIR (near-infrared) spectroscopy holds promise for sampling through packaging and containers because it can penetrate several millimeters into a material, thus seeing the characteristics of both the packaging material and the sample inside the package. Figure 1 shows an example of this problem, with a spectrum of the common sugar dextrose (blue), a spectrum of a standard 6 mil polyethylene bag (green) , and a spectrum showing dextrose inside the polyethylene bag (magenta), taken through the bag. By comparing the spectra it is clear that the dextrose absorption features can be observed through the bag. Therefore, the main challenge to using near-infrared spectroscopy is removing the contribution of the packaging from the total absorption spectrum. Basic removal techniques like spectral subtraction may work under very controlled circumstances, but they are not sophisticated enough to deal with varying packaging thickness, scattering properties, additives in the packaging, and other variations in packaging and underlying raw materials, because they are subjective and require some level of operator expertise. This problem can be complicated by the fact that some near-infrared spectrometers do not have the performance required to adequately resolve the absorbance peaks of the packaging and underlying material, making it difficult for an operator to judge how much to subtract. For example, the C-H overtone band in dextrose at 5920 cm-1 is only about 10 cm-1 (3 nm) wide, which is outside the resolution of many near-infrared instruments. However, when modern Fourier Transform near-infrared (FT-NIR) Spectrometers, like Galaxy Scientific’s QuasIR™ series, are coupled with novel chemometric techniques, such as Galaxy Scientific’s Advanced-ID™ algorithm, identification of materials through packaging becomes achievable. To illustrate the real-world utility of this technique an experiment was set up to analyze several raw materials inside various forms of packaging. Three basic samples were obtained from local sources to represent incoming raw materials: lactose, a sugar present in milk; dextrose, the naturally occurring form of glucose; and aspartame, an artificial sweetener. These samples were are fine, white powders that are nearly identical to the naked eye. 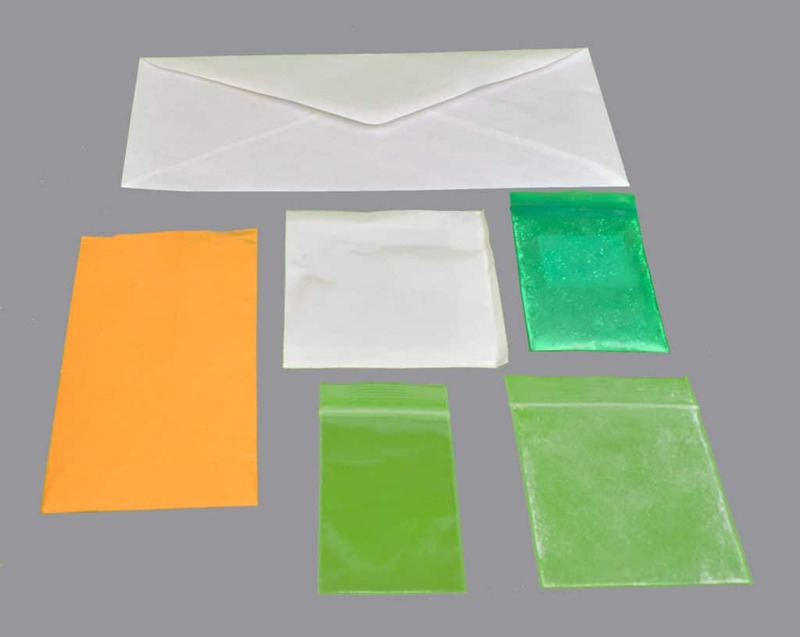 Six different containers were used to represent common types of packaging: two different clear 6-mil polyethylene bags, a green 6-mil static dissipative polyethylene bag, a white opaque 4-mil polyethylene bag, a white paper security envelope with blue dye, and a manila envelope. Figure 2 shows a photo of the bags and envelopes used in this experiment. Figure 2: Containers used for the experiment. 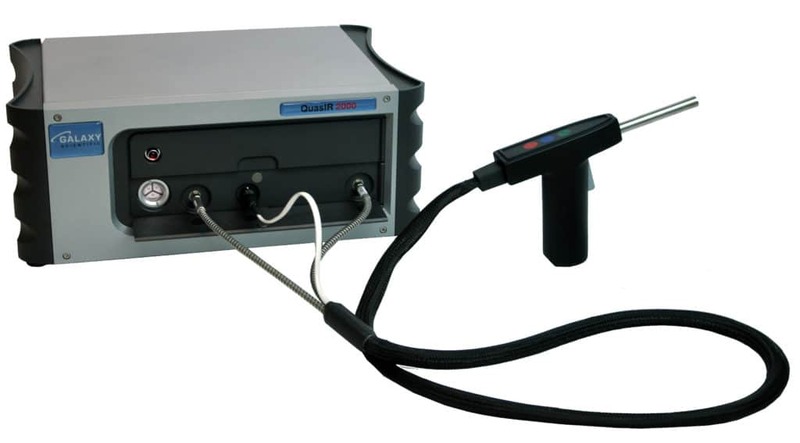 FT-NIR spectra were collected using a QuasIR™ 2000 spectrometer (Galaxy Scientific, Nashua, NH, USA) equipped with a diffuse reflectance fiber optic probe. 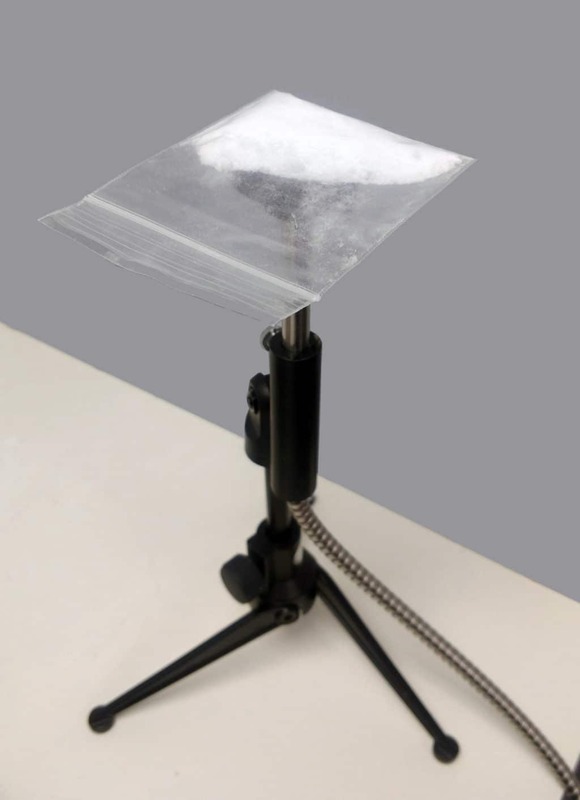 The diffuse reflectance probe was held upward using a versatile probe stand and the samples were placed on top of the probe tip for measurement. Each sample was measured at 4 cm-1 resolution and 32 scans were averaged. Three measurements were taken of each raw material, the package without raw material in it, and the package with the raw material. Samples were moved on the probe between each measurement. Figure 3 shows an example of the sampling configuration. Spectral Sage™ software was used for data collection and the Advanced-ID™ algorithm and software were used for analysis. 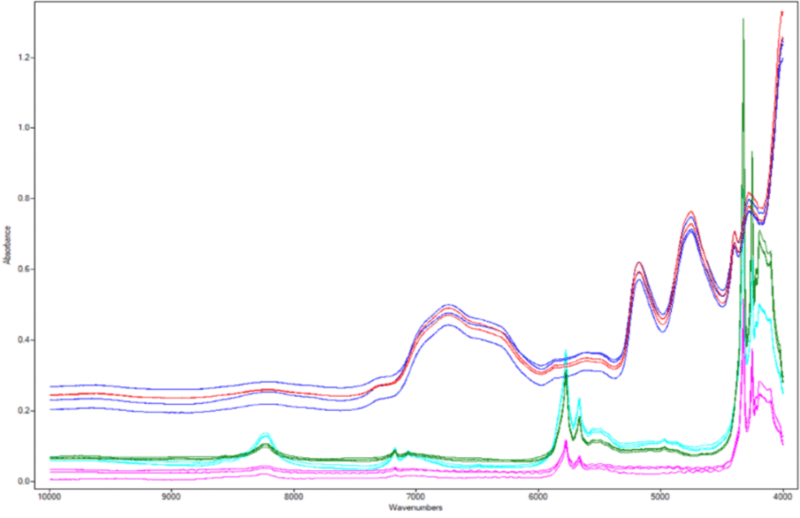 All of the pure packaging spectra were included in the analysis. The spectral range was limited to 4100-6800 cm-1 since that was the region where most of the spectral differences were present. For comparison, a standard correlation was also performed. The correlation was calculated between the raw material with packaging and the pure raw material spectrum. The spectral range of the standard correlation was also set to 4100-6800 cm-1. The pure raw material spectra used for both analyses are shown in Figure 4 and the spectra of the pure packaging material are shown in Figure 5. 1800 nm). Second, the scattering properties of the packaging and the material behind it, as well as the fact that the light must go through the packaging twice to return to the optical probe, means the effective path through the packaging may be large compared to the path in the material behind it. Figure 6 illustrates this difficulty. The green spectrum shows the result of sampling aspartame though a manila envelope. The spectrum looks nearly identical to the spectrum shown in magenta, which is the spectrum of an empty manila envelope. 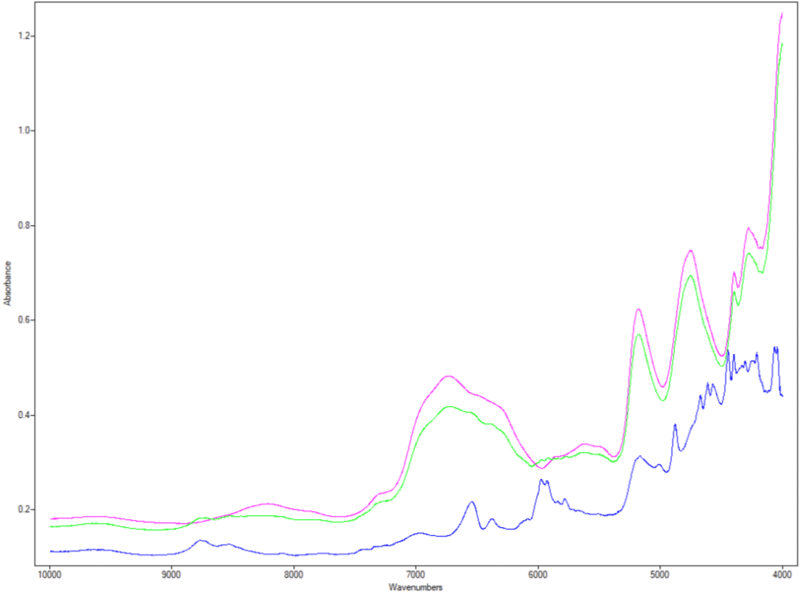 It’s nearly impossible to distinguish by eye the aspartame present in the spectrum (blue). When a simple correlation algorithm or other common spectral matching technique is used to compare the sample spectrum to the pure material spectrum, the results are obviously poor. 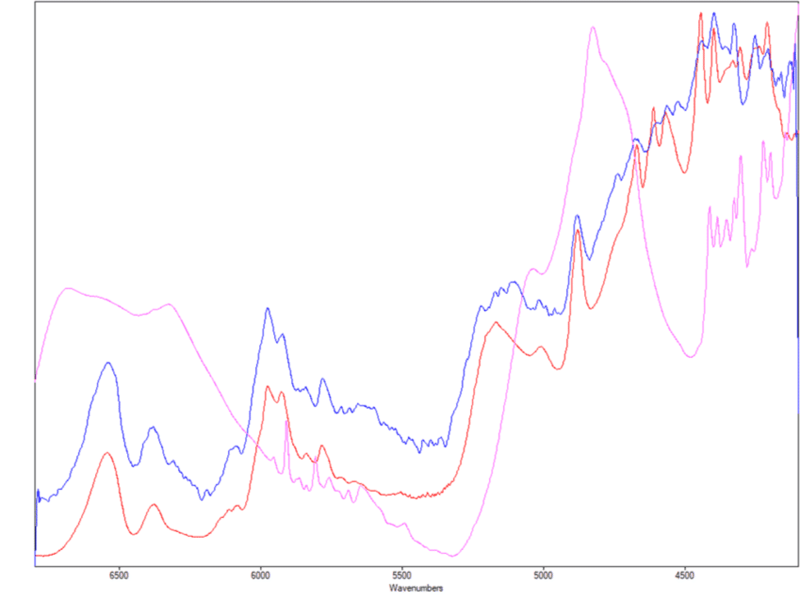 Figure 6: Spectrum of pure aspartame (blue) compared to the spectrum of a manila envelope (magenta) and aspartame sampled through a Manila envelope (blue). It is nearly impossible to distinguish the aspartame through the packaging by eye. To address this problem, Galaxy Scientific’s Advanced-ID™ algorithm first performs a least squares regression that includes both the packaging and the potential raw materials in order to approximate the sample spectrum. Next, an extracted spectrum is produced by calculating a residual with the regression coefficient for the raw material spectrum set to zero. This extracted spectrum is then used to match against the list of possible raw materials. Continuing the previous example of sampling aspartame through a manila envelope, Figure 7 shows the extracted spectrum (blue) produced by the Advanced-ID™ algorithm. The extracted spectrum can be easily compared to a pure spectrum of the material in question. In Figure 7 the extracted spectrum (blue) is compared to two possible raw materials: aspartame (red) and dextrose (magenta). Even by eye it can be seen that the extracted spectrum is a good match to aspartame. Figure 7: An example extracted spectrum from aspartame through a manila envelope (blue) produced by Advanced-ID can be compared to pure aspartame (red) and dextrose (magenta). To compare the effectiveness of the Advanced-ID™ algorithm to a traditional method, each of the collected samples was processed and compared to the simple correlation (also known as HQI or hit quality index) result. 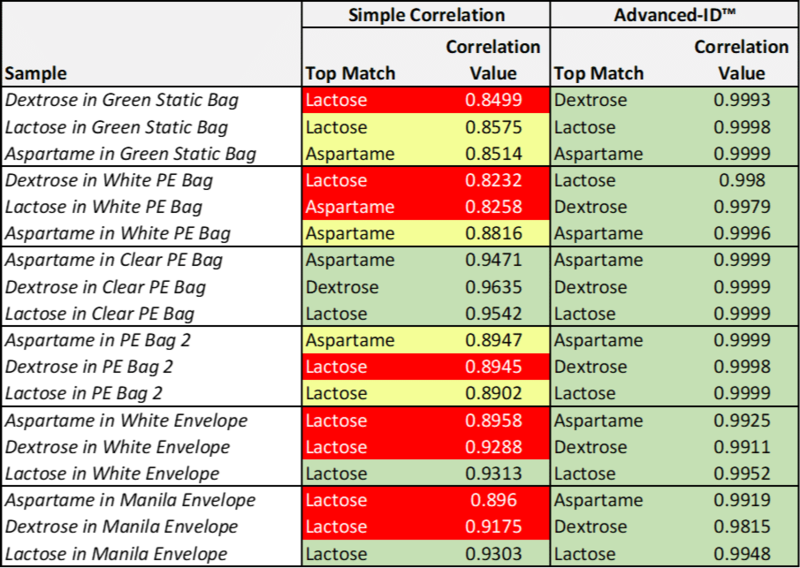 Table 1 shows the top match result using simple correlation, the coefficient of correlation to the top match, the top match of the Advanced-ID™ method, and the coefficient of correlation of the extracted spectrum to the top match. The cells are shaded red if the match was incorrect, yellow if the match was correct but had a correlation value below 0.9, and green if the match was correct and had a high correlation coefficient. For brevity only one sample of the three taken is shown in the table. The other two samples had very close correlation results. As Table 1 illustrates, the traditional correlation method produces a correct match on only 10 out of 18 samples. Additionally, four of those samples have a correlation coefficient below 0.9, which is usually indicative of a poor match. The Advanced-ID™ method produces the correct match 18 out of 18 times and every match has a correlation coefficient above 0.98, indicating that the match to the pure spectrum is very good. It is obvious from Table 1 that Advanced-ID™ can successfully extract the target spectrum from the packaging material and provide a correct match with high confidence in the result. In contrast, the simple correlation algorithm does not perform well in the presence of packaging and often produces “lactose” as the top match due to the similarity between the packaging and lactose spectra. If the spectrum of the packaging material had been included in the list of possible raw material spectra that the correlation algorithm compares to, the packaging material would have been the top match. While subtracting the packaging spectrum from the original sample spectrum might slightly improve the results of the simple correlation method, it would require advanced information about which packaging material was present. Even then, it would still be much less effective than Advanced-ID™ due to variation in the packaging thickness and other inconsistencies. As already noted, manual subtraction is also subjective and relies on operator skill. 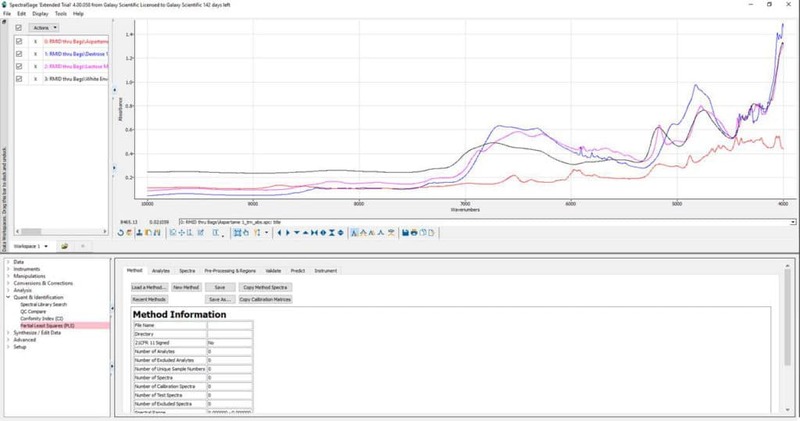 It should be noted that Advanced-ID™ requires spectra of the packaging to be available in order to perform the least-squares regression and produce the extracted spectrum. However, the packaging does not need to be exactly the same as that used with the sample. To demonstrate this, the packaging material used in the “PE Bag 2” samples was not included in the library of potential packaging materials. Since the other packaging materials were made of polyethylene, they were able to be fitted to the sample spectrum and removed successfully in spite of any differences in the material thickness or composition. The correlation coefficients from this set of data were only slightly lower than correlation coefficients from the “Clear PE bag” data set where the packaging spectra was included in the packaging library. The analysis was still successful because the least-squares fitting allows for variation in the packaging spectra that makes up for differences in packaging thickness or subtle variations in material. 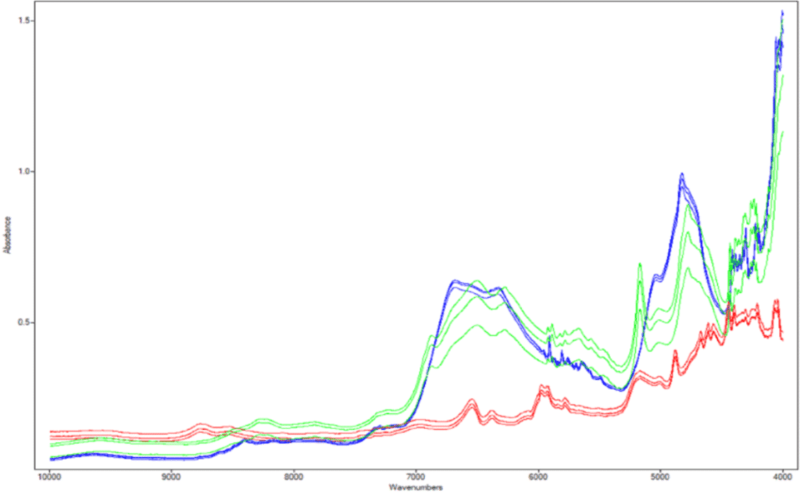 This shows that only a relatively small library of packaging spectra are needed to make the algorithm work well. Another important point is that all of the packaging materials used in this experiment were included in the packaging library for every analysis. There was no need for a prior knowledge of which packaging material a sample was contained in. The algorithm fits all of the possible packaging spectra and gives higher regression coefficients (e.g. mathematical weights) to the ones that closely match the sample spectrum. This makes the method very convenient to use, even when the packaging varies between different raw materials or raw material suppliers. Finally, it’s important to realize that the matching algorithm used on the extracted spectrum was a simple correlation. Just as more advanced matching techniques, for example the use of derivatives, can improve upon simple correlation results, the same techniques can be applied to the extracted spectrum produced from Advanced-ID™. For example, results could be improved by pre-processing the extracted spectrum, feeding extracted spectrum into SIMCA or cluster analysis, or using another statistical method that weights the spectral regions based on noise bands or other factors. Using Galaxy Scientific’s Advanced-ID™ algorithm and the QuasIR™ series FT-NIR, raw materials can be identified through common types of packaging like polyethylene and paper. This method substantially improves the ability to verify incoming raw materials using near-infrared spectroscopy.